Consistent application of the university’s visual identity (commonly called the logo or mark) is the cornerstone of a consistent brand. The university’s identity system is limited to just a few variations to make it easy to follow. Proper usage of each of the marks on this page is explained in the sections that follow. 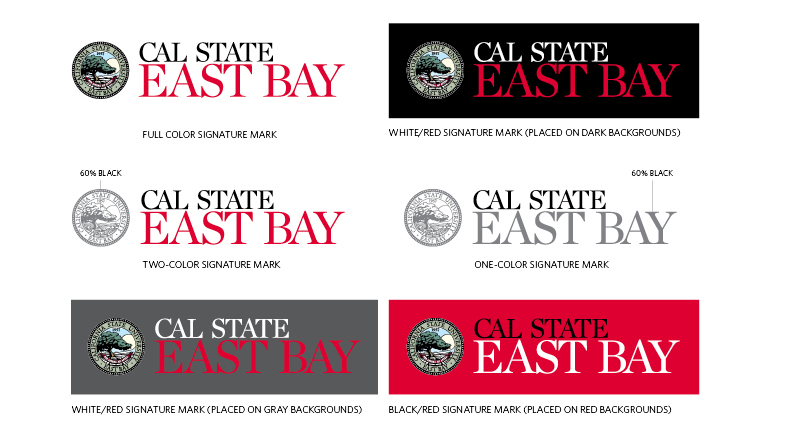 The signature mark is comprised of the Cal State East Bay logotype and the university seal. It juxtaposes a sense of tradition, embodied in the seal, and the bold and contemporary character of the logotype. It is the mark that appears on university letterhead and business cards. The signature mark is reserved for formal, core functions of the university, including official communications, messages from the administration, colleges and departments, and documentation between the university and its constituents. The signature mark should always be reproduced exactly as shown, with no alteration to the components or the proportions between them. The mark should not be encroached by text or imagery; it should always have a clear space on all four sides that is at least equivalent to the height of the “East Bay” lettering. To ensure proper reproduction of the signature mark, please use the downloadable file in the "signature mark" section of this page. These are the authorized color variations of the signature mark. No other colors should be used. The signature mark can incorporate the name of a college or division and a specific department or program. This sub-branding should follow the specifications and proportions detailed above. The division or college name and department or program name should not exceed the width of the “East Bay” lettering. To ensure proper reproduction of an integrated signature mark, please obtain an electronic artwork file from University Communications at university.communications@csueastbay.edu. The signature mark should always be produced exactly as shown in the section above titled "signature mark" in full-color applications, or within the authorized color variations shown on the preceding page. Otherwise, the seal, coloring, type fonts and proportions of the mark should never be altered, nor should extra words or design elements be added. This is the signature mark and tagline “lockup.” With rare exception (for example, if the tagline is used as a headline), the tagline should always be locked up with the mark as shown in one of the two variations above: stacked (top) and horizontal (bottom). The standard logo consists of the Cal State East Bay logotype in the university’s black and red colors. It is a simple, clean, bold and contemporary type treatment that reflects a strong and energetic brand. This is the primary logo to be used for the majority of applications, including marketing-communications materials and advertising, events and general branding. The standard logo should always be reproduced exactly as shown, with no alteration to the components or the proportions between them. The mark should not be encroached by text or imagery; it should always have a clear space on all four sides that is at least equivalent to the height of the “East Bay” lettering. To ensure proper reproduction of the standard logo, please obtain an electronic artwork file in the downloads section. These are the authorized color variations of the standard logo for use in full-color, black and white, and against a black background. No other colors or variations should be used. The standard logo should always be produced exactly as shown in the "standard logo" section in full-color applications, or within the authorized color variations shown on the preceding pages. Otherwise, coloring, type fonts and proportions of the mark should never be altered, nor should extra words or design elements be added. This is the standard logo and tagline “lockup.” With rare exception (for example, if the tagline is used as a headline), the tagline should always be locked up with the mark as shown in one of the two variations above: stacked (top) and horizontal (bottom). The full name wordmark has been designed for use in documents that call for the university’s official name. It consists of the official name set in the university’s logotype, rendered in black and red. Its use should be restricted to official documents that require a full name signature. It should not be used for marketing, communications or branding purposes. To ensure proper reproduction of the standard logo, please obtain an electronic artwork file from University Communications in the downloads section. Do not attempt to recreate the full name wordmark or alter the artwork in any way. The EB mark is used on certain team uniforms and is licensed for athletic-related merchandise such as sweatshirts and T-shirts. Its use should be limited to athletic and “school spirit” applications. The athletics program department logo, used with or without the word “Athletics,” is the primary identifier of the university athletics program department. It is to be used in athletics program letterhead and communications. Team logos are to be used in team letterhead and communications from specific teams. In the color version, “Pioneers” always appears in red. In the black and white version, it appears in black. 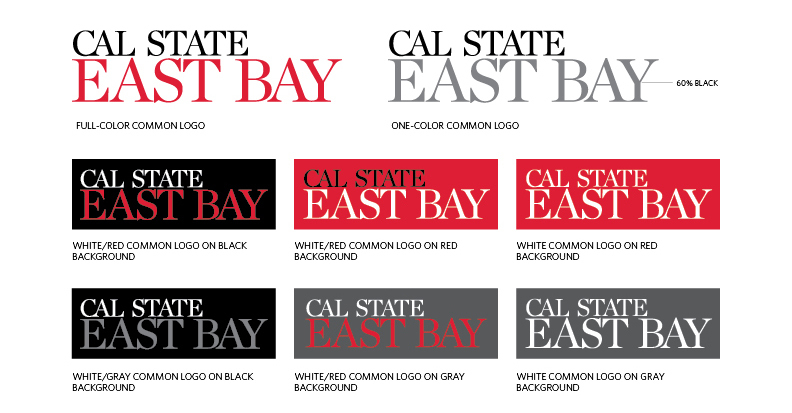 In both versions, “Cal State East Bay” and the sport name can be either “knocked out” (white against color background) or black. Contact University Communications with any questions regarding the use of athletic logos at university.communications@csueastbay.edu. These are the authorized color variations of the 60th Anniversary mark for use in full-color, black and white, and against a black background. No other colors or variations should be used.